Assembly Technologies P/L are the Australian importers of Deprag and Cengar products. Hand held and machine mounted precision screwdrivers (automatic screwdrivers). 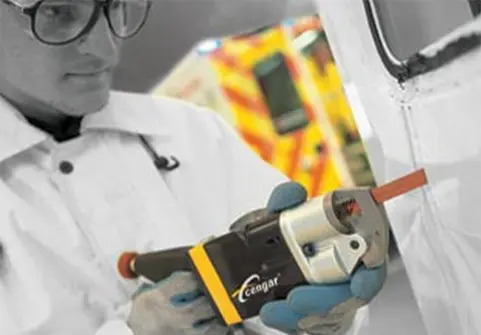 Deprag's torque screwdrivers are available in pneumatic or electric drive and feature robust, ergonomic design as well as being highly accurate. All of the screwdrivers have an accuracy of ±3% standard deviation or better. Screw assembly is an often overlooked part of an assembly. Correctly designed screw joints, the correct screws and torque setting are essential to achieve a quality product. Missing or incorrectly torqued screws are a leading cause of product failure and can cause costly warranty repairs. Deprag offer the most accurate torque controlled screwdrivers and automatic screwdrivers on the market as well as proven solutions to quarantee a quality assembly. Deprag also specialises in auto feed screwdrivers, screw assembly machine, and automatic screw feeding machines however they can manufacture the feeders to suit most kinds of small parts. We can feed screws or parts to a hand guided screwdriver or press in device though a hose as well as to machine mounted equipment. Our feeders are available in various sizes with either a vibratory drive or a sword feeder. Deprag's has one of the largest range of pneumatic air powered motors on the market. We cover from 20W upto 18kW with numerous speeds/ gearing in each motor size. We have stainless steel bodied compressed air motors, high torque air powered motors, brake motors, sealed motors and ATEX approved pneumatic air motors. Deprag are also able to manufacture custom built motors to suit your application and specifications. We import Cengar Air Hacksaws, Deprag and Spitznas pneumatic hacksaws. The Cengar range includes 5 piston motor air hacksaws for cutting upto 300mm pipes including a saw for underground mines. The Spitznas range includes a high powered air sabre saw for freehand cutting as well as a large pneumatic reciprocating saw for cutting upto 530mm diameter pipes. Deprag manufacture a heavy duty air hacksaw for underground mines. Pneumatic air hacksaws are the tool of choice when materials need to be cut in hazardous areas such as oil & gas refineries, chemical factories or oil rigs as well as dusty and wet environments where electric tools are not reliable enough. Air hacksaws are also valuable tools in production environments such as pallet repair, shipbuilding or fiberglass workshops beacuse they will last longer than electric tools especially in dusty or wet environments.